As Hurricane Michael whirled toward Florida over a week ago, Meg Baldwin went into overdrive. As executive director of Refuge House, which works to end domestic violence in the Big Bend, she had to ensure her organization was ready for what she knew was coming: increased calls to their hotline, and a spike in urgent need for shelter from survivors and victims. Baldwin’s expectation didn’t come out of nowhere. When disaster strikes, domestic violence follows—not just in Florida but around the world, according to the World Health Organization. The violence can take many forms, from child abuse to sexual violence to intimate partner violence. People like Baldwin have seen it all firsthand before. And with residents of the Panhandle still reeling from Michael’s destruction, there are already signs that the cycle of violence could repeat itself. A considerable number of hotline calls came in before the storm in the eight northern Florida counties Refuge House serves, including hard-hit Wakullaand Gadsden counties, said Baldwin. People, largely women,were seeking immediate shelter (both from the storm and their abuser), and the House’s two emergency shelter locations were overcapacity by the time Hurricane Michael made landfall October 10 as a Category 4 storm. The shelters held more than 60 women between the two, compared with the usual 35 to 40, said Baldwin. A 20-person addition might not sound like a lot, but it is for this rural region. “With the storm hitting those communities, it means that already-isolated victims are even more isolated. It means the resources of law enforcement intended for their protection has been sent to other needs. Escaping abusers is key during disasters because studies show that violence grows more severe in relationships that already experience it and its prevalence increases across the board, said Jennifer First, a mental health program manager at the Disaster and Community Crisis Center at the University of Missouri who’s done extensive research in this area. And one doesn’t need to look far back in the history books for proof. Take Hurricane Harvey, which struck Houston in August 2017. The number of domestic violence victims who sought help between January and August from the Crisis Center at the Katy Christian Ministries, which serves the West Houston area, more than doubled from 417 in 2017 to 1,025 this year. Reports of sexual abuse the center received nearly tripled, according to a report the center released earlier this week. For Hurricane Maria, the deadliest storm in modern U.S. history, the situation didn’t look much better. Lack of power threatened the elderly and sick who needed machines for their medicine, but this darkness also left abusesurvivors and victims on the island vulnerable, as Refinery 29 reported. 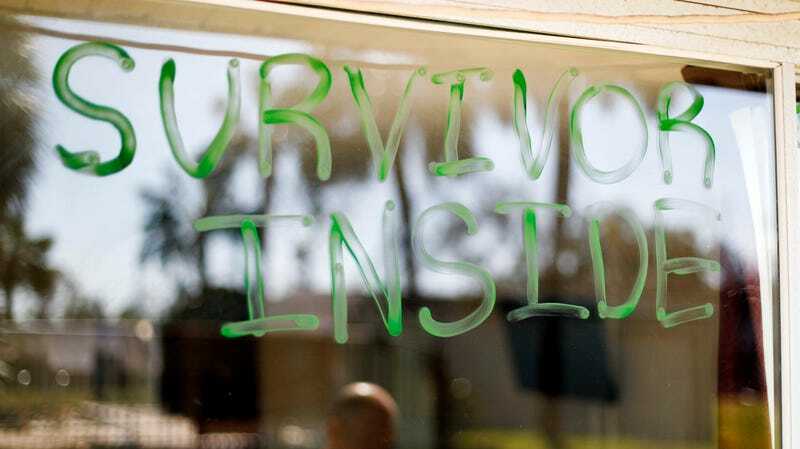 After the storm, local nonprofit ESCAPE saw requests for survivor-related services increase by 62 percent. A similar spike in domestic violence has been documented after Hurricane Andrew in 1992, Hurricane Katrina in 2005, and Hurricane Sandy in 2012. For some, this abuse can be deadly: Nearly half of all female homicide victims are killed by a current or former intimate partner, according to the Centers for Disease Control and Prevention. Nearly one in five women and about one in seven men report having experienced severe physical violence from an intimate partner in their lifetime, per the CDC. Women of color are especially at risk. Why? A lot of the data points to stress. After disasters like hurricanesstrike, communities are more likely to experience employment loss, displacement, loss of housing, and financial issues. All this is especially true for communities of color and low-income neighborhoods already experiencing these inequalities. (Michael struck the state’s poorest region.) Even without a natural disaster, economic and housing challenges can increase the risk of domestic violence, First said. Throw a hurricane into the mix, and chaos can ensue. States like New Jersey and Missouri have begun addressing the spike in domestic violence that accompanies natural disasters through training to emergency response teams and increased funding to domestic violence victims, but more needs to happen—especially in coastal communities in the South that deal with these hurricanes the most, said First. At least in the part of Florida Baldwin serves, her team at Refuge House goes door to door with relief agencies. The state brings the food and water, and Refuge House brings the counseling and comfort victims may seek during this tumultuous time. They’ve been doing this for the last 10 years and remain on the ground in wake of Hurricane Michael. While victims and survivors needed immediate shelter at first, in the weeks and months to come they may need help finding permanent housing or protection from an abuser. As the data shows us, the danger can last long after a storm passes. These coming weeks are just the beginning.